It would be remiss of me not to at least mention in passing, the big blow that hit wide areas of Tasmania in the early hours of yesterday (Thursday) morning. With winds reaching a reported 176km/hr on a nearby hill, I can confirm that it was an horrendous, sleepless night. Many houses suffered damage, most of it relatively minor (loss of roofing etc), and many hundreds of trees were damaged or blown down, some taking out power lines causing blackouts (nearly 5 hours in my case). After an inspection of the outside of the house, thankfully intact, and removing some of the tree debris from my garden, I drove to a nearby vantage point overlooking the Derwent River. From there I took the accompanying shot of one of several Australasian Gannets fishing offshore, their white plumage contrasting against the dullness of the morning. 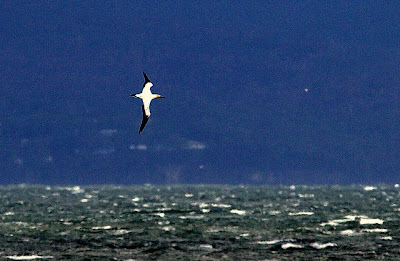 They were among many hundreds of 'muttonbirds', (the local name for the Short-tailed Shearwater), living up to their name, flying fast and low over the water. Close inspection through the bins., I noticed scores of Crested Terns, and way down the river, 2 Giant Petrel, unfortunately too far away for me to ID whether they were Northern or Southern. By mid morning the strong winds had abated and so had all the action in the river, but the memory of the big blow will not be so easily forgotten!